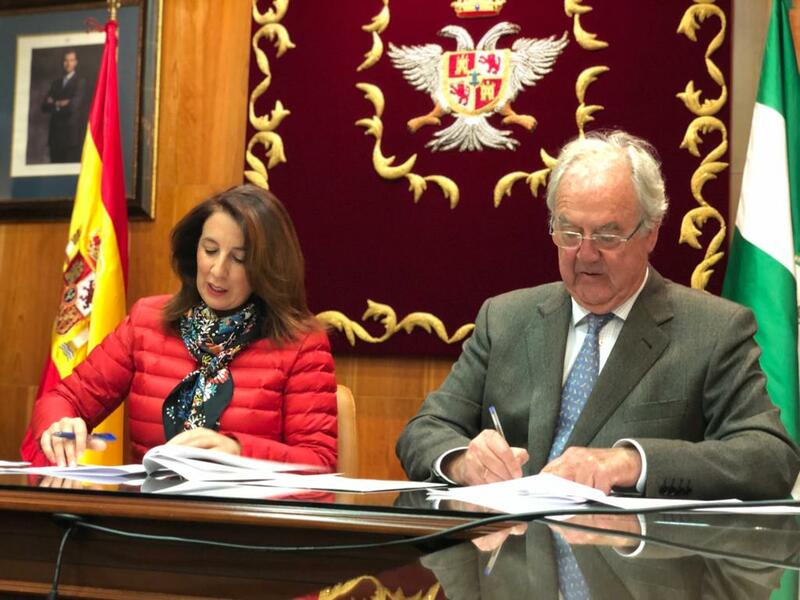 January 17, 2019.– The mayor of Alhaurín el Grande (Málaga), Toñi Ledesma, and the president of the Andalusia Smart City Cluster, Mariano Barroso, signed a collaboration framework agreement this morning to promote actions in the municipality to make progress in the smart city model, understood as more efficient, sustainable and comfortable for citizens.The agreement includes as a basis for joint work the contribution of solutions in the fields of mobility, energy efficiency, the environment and citizen management platforms, with the contribution not only of the Andalusian cluster itself but also of the knowledge and innovation generated by the companies and technological centers of Andalusia. Likewise, the agreement contemplates the impulse to the innovation in products, processes and services associated to the intelligent urban infrastructures, the fortification of the bidirectional communication between the city council and the citizens, the set up of pilot projects of new technologies and processes of smart city, the revaluation of the natural and cultural attractions of the city through technological solutions and the promotion of training activities and organization of events related to intelligent urban infrastructures, among other aspects. The mayor, Toñi Ledesma, stressed that “with the signing of this agreement, Alhaurín el Grande joins the select group of Andalusian cities committed to sustainable urban development and integrated in areas such as the environment and resource efficiency, low economy in carbon or social inclusion, where the use and quality of ICTs and public-private collaboration systems can offer us innovative solutions for our present and immediate future. This is an important step in the “Alhaurín el Grande 2025, integrative culture” project, which has already received the support and recognition of the European Social Fund “. For his part, the president of the Andalusian Smart City Cluster, Mariano Barroso, said that “through the Cluster, we deepened the fruitful relationship started months ago with the town of Alhaurin el Grande, which stands out for its interest and firm commitment to apply the technologies of management and urban efficiency in the municipality advancing in its development as an intelligent city “. At the same time, Mariano Barroso has accentuated the economic impact in cities and towns has the application of smart city solutions not only in cost savings to the municipal coffers but also as job generators and business opportunities for the local business fabric. Andalucía Smart City is an alliance of Andalusian companies and institutions that work in the development of smart cities, understood as efficient, sustainable and comfortable, through the cooperation of the associated entities, among which are private companies, universities, town halls and sectoral organizations, among other entities in the field not only business but also research, development and innovation. The projects that Andalucía Smart City deals with aim to generate employment and wealth in the cities themselves by improving business competitiveness, promoting business opportunities and creating new markets, products and services. Andalucía Smart City acts in the development of projects that revert to improving the habitability, comfort and quality of life of citizens of any Andalusian urban nucleus, regardless of their size, through R + D + i projects, in order to build better cities, with a greater degree of environmental sustainability and with a more efficient management of resources. The multisectorial, integrative and cooperative nature of Andalusia Smart City brings it to bring together entities from different areas that operate in favor of cities such as energy, the environment, urban infrastructures, information and communication technologies, urban mobility or citizen administration. The Cluster is recognized as an Innovative Business Association (AEI), by the Ministry of Economy, Industry and Competitiveness, since May 2015.